Abstract: As you can probably tell, we like Firefox a lot. So does everyone else on the web, judging from the results of PCstats latest poll. Nothing compares to the power of positive press. One moment there was Microsoft's Internet Explorer, standing tall against a small horde of 'alternative' web browsers, none of which had the following to seriously threaten the giant; the next moment Mozilla's Firefox 1.0 appeared, seemingly fully formed in an instant and gaining momentum at a furious rate. Suddenly we have the potential for a browser war again... we haven't seen anything like this since Netscape became a swear word on the lips of AOL customers. Not coincidentally, Netscape and Mozilla (the open source project behind the Firefox browser) share a common source. Firefox is sort of a 'second generation' release of the Mozilla browser, which was developed from Netscape's open source code long before AOL came along. Firefox (like Mozilla) has been in development for a while, slowly perfecting its browser technology on both Windows and Linux platforms. It shows. Firefox is a startlingly mature product, full of features but just as easy to use as IE has proven to be. For a browser to gain mass adoption, this is an essential characteristic. Download and try FireFox right here. 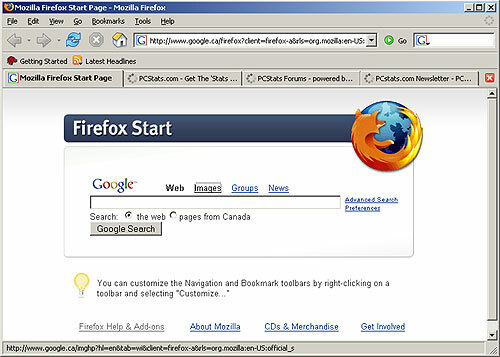 PCstats is going to explore the features and capabilities of Firefox 1.0 as compared to the XP Service Pack 2 update of Microsoft's Internet Explorer 6. We're looking for useful features, innovation and ease of use, as well as security. If you're trying to figure out whether to make the switch to Firefox, this is the article for you. Firefox is very simple to get up and running. The 4.7MB download size will cause no pain, even for 56K modem users. Once installed, you can make Firefox your default browser by going to the 'tools\options\general' tab and highlighting the option. Without this, Firefox will not make itself the default browser, nor prompt you for permission to do so. Such a polite boy...! Whether it is the default browser or not, Firefox will coexist peacefully with Internet Explorer. Anyone who's used a web browser before will feel at home here. The familiar forward, back and home buttons are available, along with the address bar and the usual menu options. All buttons and tool bars are where you would expect them to be; meaning that they are in more or less the same places as Internet Explorer's controls. Getting to grips with the Firefox browser requires no learning curve at all. One nice addition to the standard browser menu list is the 'go' bar that Firefox uses. This functions as a sort of 'recent history' button, in that it stores the last ten pages you have visited in any Firefox window or tab. This is a good idea that can speed up your browsing. The 'go' menu also links to the actual browser history. We were disappointed to see that Mozilla has succumbed to 'bookmark bloat,' that strange compulsion that causes browser manufacturers to add all sorts of useless link folders into the bookmarks (favorites) menu by default. You can get rid of them, fortunately. It's no fun adding your first ever bookmark into a new browser, only to have trouble finding it because the bookmark menu is already cluttered with stuff. Now let's take a closer look at some of these features, starting with one of Firefox's most innovative features, tabbed browsing.